It’s tough to figure out whether the meat that’s a day or two past its sale date is safe to eat or not. It might smell alright but there’s a reason for the date on it and no one likes food poisoning. Well there’s a new gadget that might take the guessing out of the process. Peres is a small handheld sniffer that samples the air around the meat. It measures the levels of organic compounds and ammonia along with the temperature and humidity of the surroundings. This data is then transmitted to your smartphone or tablet via Bluetooth so that it can be analyzed. After analyzing the data, an app tells you if the food is fresh, safe to be eaten straight away or should be thrown away. The results can also be shared through your social media accounts, but it is unclear as to what purpose this function ultimately serves (who would want to tell their friends and society that their meat has gone bad?). 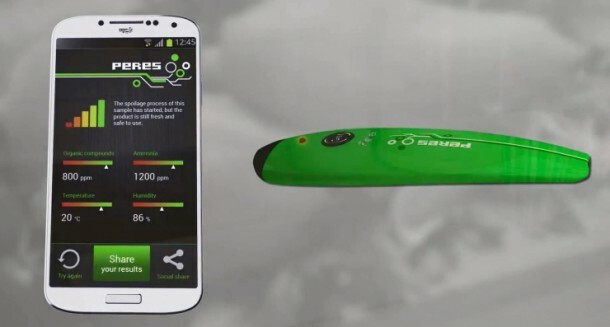 The device was developed by researchers at the Kaunas University of Technology in Lithuania and can measure the freshness of beef, pork, poultry and fish. Peres is quite versatile as it does not require participation from the distributors of the meat, meaning it can be used on the meat from your local butcher or from the supermarket and give you equally accurate results. Although, it will be hard to convince the butcher to let you sniff around his supply of meat with your Peres. 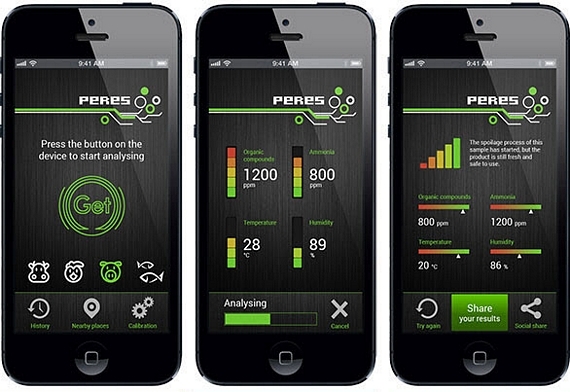 Peres has an Indiegogo campaign that seems to be faring quite well. With a month still left in the campaign the product has achieved more than half the target funding. The entry level contribution that will get you a Peres at the moment is $120, and this means you will be able to get one of the first products off the line when they start shipping this fall. Until then, you’re going to have to check for freshness the old fashioned way.